As for the name? Ah screw it. The optimal choice is already familiar. The only way Chavez Ravine could be a better name for the ballpark is if Vin Scully’s middle name was Chavez. Or Ravine. *Sorry, Mariano, Rodney and Johnny M. Unlike you guys, the hat’s origins are not Panamanian. In 1985, Lane Myer completed his tumultuous courtship of the lovely French foreign exchange student Monique Junet with a home-plate embrace. In 1988, Kirk Gibson hobbled up to the plate and hit baseball’s ultimate Hollywood-certified long ball, taking the game’s premier closer, Dennis Eckersley, deep in Game 1 of the World Series. The homer propelled the Dodgers to a 4-1 Fall Classic waltz over the heavily favored A’s. In 2009, Ichiro’s two-run single with two outs in the top of the 10th delivered to Japan to its second straight World Baseball Classic title with a 5-3 victory over Korea. How was this not in the week where the current name was confirmed? Not so fast! Why isn't it Dodgers Stadium? We may have the chance to redress a bizarre wrong here. 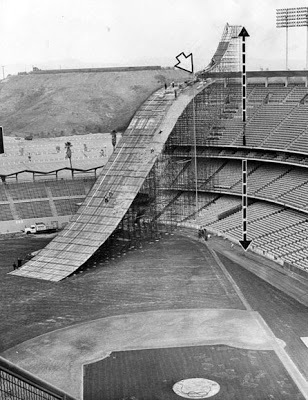 The internet tells me it was also called Chavez Ravine Stadium by the Angels when it was their home in the 60's. It's Yankee Stadium isn't it? And Oriole Park? I guess it used to be Royals Stadium before they changed it to honor Kaufman. This is an interesting point to make. What are the other examples of plural team names in ballparks? The Hollywood Stars played at Gilmore Field, and the PCL Angels of course at Wrigley Field. The former would be worth reviving if "Dodger Stadium" wasn't so natural. Gilmore was an old-fashioned oil baron, but at least his name sounds like Hollywood and baseball. Though I do like the fact that "Chavez Ravine" is available as an alternative. It's one of those nice locale names, like Camden Yards or Willets Point. went there in 1985, I think, and saw Orel Hershiser vs Joaquin Andujar. decided to go to the concession stand to get a Dodger(s) Dog. had about 5 people in front of me. I returned to my seat in the bottom of the 6th. LA was funny then. had a similar experience at a Burger King there. the workers moved like it was 1956.
from Redondo Beach (or was it Manhattan Beach), walking down the hill toward the beach, the cars would stop at a green light just in case you wanted to cross the road. we felt guilty, and turned on our right-turn arm signals to indicate that they could carry on. the world, and LA, has changed. walking into the park and being at the top of the stadium - they call it Chavez Ravine for a reason - is totally awesome. What is going on in the picture? why do they have a ramp? Sorry, I'm confused. How does Chavez Ravine fit into the current name? What's the official name of the stadium? Chavez Ravine is just the nickname for Dodger Stadium, because it's the neighborhood (the ravine, I guess) where the stadium was built. The city forcibly cleared all the Chavezes out of the area to build public housing, but they decided to build a baseball stadium there instead. It's a pretty interesting and sad story. Because Chavez Ravine is just a marvelous name for a ballpark (or anything), no matter how the damn results turn out. It's a ski jump. They held a competition in the 1960s, though some of the planned events were scuttled. No 'stadium' or 'park' or anything. Just Chavez Ravine. Another vote for Chavez Ravine. the guy in the Ecuadorian* straw hat who used to stand behind home plate with the JUGS Gun. But, yes, Chavez Ravine should have been the stadium name. We can now (virtually) right that wrong. So....... did this just stop? No. I did a last call for votes last week in the voting thread, but no one added anything. I just didn't declare the winner since we were into the playoffs. Chavez Ravine narrowly edged Dodger Stadium. We'll resume with the last three clubs after the World Series. Even though that thread is tagged with 'stadium names' - it doesn't show up when you click stadium names. Tags don't work on this website.